is within walking distance of hotels and offices. The restaurant has two levels with two distinct personalities. The first floor is lively and upbeat to reflect the commitment of Steak and Ale to casual dining at its best. The spacious bar area accommodates live entertainment for the after work and after dinner crowd. Our private banquet rooms with a salad bar are located upstairs and can be reserved for small and large groups. You can reserve a private banquet room for up to 100. And yes, we really mean “Have a Meeting.” Our banquet room features a wireless PA system, projection screen, TV/VCR and is cable accessible. Kick off your meeting in the morning with coffee and bagels, then wrap it up with a buffet or seated luncheon. Wedding receptions. Birthday dinners. We’ll arrange our tables to suit your occasion. Colored table linen? Flower delivery? No problem. We’ll provide the atmosphere, you provide the toast. Team Celebration? You met your goal; now let your group relax and have fun with an after-work happy hour. We’ll turn our salad bar into a beer bath, crank up the music and keep the appetizers coming. Or plan a cocktail hour before a leisurely paced dinner. One thing we haven’t changed is our commitment to great steaks and our market fresh salad bar. Whether it’s a party or a business meeting, you’ll need a menu offering that says “special occasion.” We offer a variety of packages to fit any budget. 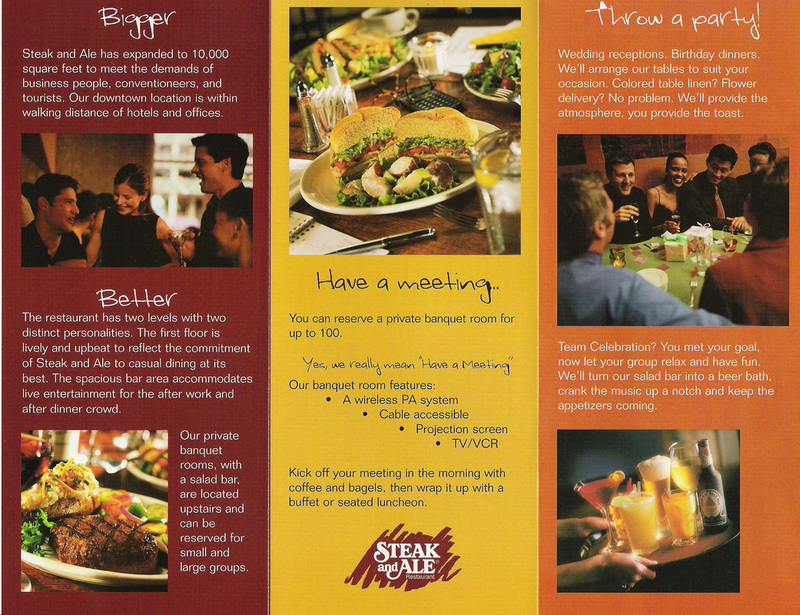 Choose from one of our special plans or let us create a custom menu to suit your budget. Call us for your next event. Our professionally trained banquet coordinators will handle the rest.